Deciding what technology would serve us best in such a far-flung location was key in planning the trip. As well as the obvious challenges of being in such a remote place (no phone reception or internet access! ), we also had to consider the nature of the expedition itself – ie trekking on foot across hot, sandy desert with no support vehicles. The Sony HVR-A1 was my video camera of choice – compact and lightweight, it’s ideal for situations where extreme mobility is needed, but doesn’t compromise on image quality. I took a few additional accessories – small tripod, wide angle lens, fluffy microphone to combat the noise of the Saharan winds, spare batteries, and of course plenty of DV tapes. This set-up fitted neatly into a large back-pack – and we hired a trusty Moroccan porter named Mohammed to carry it on the trek, so that I’d have it immediately to hand whenever required. In such an iconic and photogenic location as the Sahara, a good stills camera was an absolute must. I shot images of the location and the trekking group using my new Nikon D3100 with a couple of interchangeable lenses – 18-55mm and 55-200mm. At 450g, it’s Nikon’s lightest SLR camera and has a great range of features including full HD. I used lens filters to combat the glare of the desert sun (and protect the lenses from sand and scratches), and the video camera tripod doubled up for use with the Nikon too. The stills and footage I shot with the A1 and the D3100 were supplemented with material from Russ’s iPhone 4. The image quality of the new iPhone is really impressive, and Russ was able to capture short videos and photographs in the heat of the moment that we might otherwise have missed with the more “regular” cameras. So how did we upload all these images to the UNICEF and Big Earth websites from the middle of the Sahara? Well it all came down to a handy set-up called a BGAN (Broadband Global Area Network) – a remote-area mobile satellite system which, when loaded onto a laptop, can connect you to the internet, no matter where on the planet you are. News media organisations use the BGAN to file reports from war zones, disaster-hit areas, sports events and remote regions. It was a really satisfying feeling uploading the materials each night from the middle of the desert, knowing that people back home would see them and feel part of our journey as it unfolded. I still marvel that we were able to get internet access in the middle of nowhere! Got some expedition tech tips you’d like to share? Post a comment below. 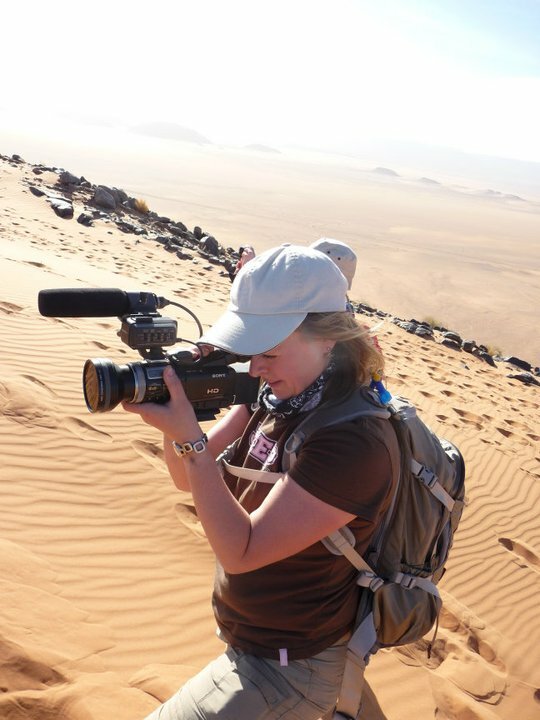 This entry was posted in Adventure Travel and tagged Morocco; filming; trek: UNICEF on March 4, 2011 by Jeanie Davison.